Well, we did it. Somehow my little idea grew into a great big event with 30 people, my amazing assistant coach, and a gorgeous location not terribly far from home. What happens when 20 working spots are occupied by compassionate trainer-handlers and their supremely talented dogs? What happens when two coaches who not only get but adore Worked Up teams come together to teach? What happens when we all realize that we are not actually alone in our struggles. When people walk the walk, the talk just happens. I mean to say that I saw campers prioritizing daily decompression for their dogs. I saw campers treat each other with kindness and respect. I saw campers embrace tough learning moments, and laugh through their struggles. Every single day I saw people thinking hard, working hard, and holding their dogs to a very high regard. The questions were thoughtful, the work was quality, and everyone was there to elevate, not to “practice.” When I launched the Worked Up online course I had no idea what a community it would build. That community is why I hosted this camp, and they did not disappoint. Pick your team, and the rest will be easy. I did not do this alone. I never do anything alone. My assistant coach, Casey Coughlin of Inspiration Canine in Connecticut was exactly the person I wanted to teach opposite for this camp. She knows the program inside and out, she is kind and clear in her coaching, and her dog training eye is a good one. But I had so much more help than just Casey! Ashley Johnson and Brandi Oakley, both talented Worked Up alumna and fine trainers themselves traveled far to work their buns off for me. I could not have done this thing without their help. 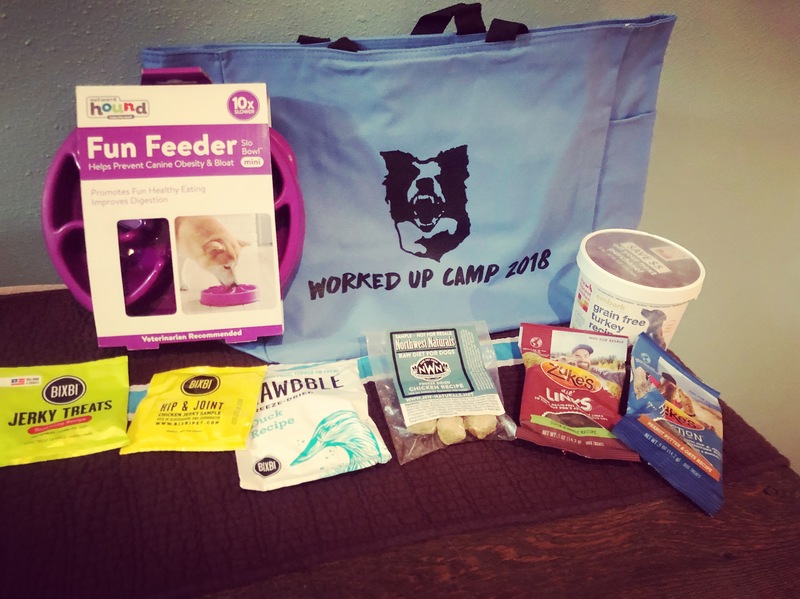 The swag bag to end all swag bags…. Yeah, it was the best swag bag ever. Zukes, The Honest Kitchen, Bixbi, Northwest Naturals, and Outward Hound all contributed to making these bags some of the best I have ever seen. Jealous? You should be. Of course, improvements can be made and I am already hard at work planning next year’s camp. I know several things I am going to change, which is pretty much how I operate. Who wants to do the same thing twice?